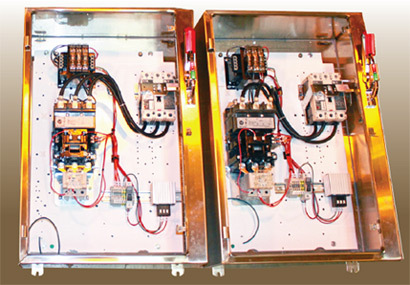 Design and build a control system to operate two parking lot pumps at a petroleum facility. The control system is to consist of simple components, no programmable controllers, to alternate two pumps for load sharing and have hand off auto switch for both pumps to operate one at a time in auto or manually. Additionally, the system is to include two motor starters, high and low floats, and meet the facilities sight requirements.